Light Color: RGB. Emitted Colour : Red / Green / Blue. Size: 5mm length :about 4.5CM. Lens Color : water Clear/diffused. Blue 3 3.4 460 465 4000 5000 10 20-25. Green 3 3.4 520 530 6000 8000 10 20-25. 10W, Candelabra Base, G12.5. Bulb Shape: G12.5. 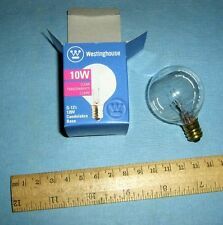 Westinghouse Clear Light Bulb. Model:03831 WESTINGHOUSE. Bulb Finish: CLEAR, TRANSPARENT. New in Box. Note: We have many of this item available. Sponsor your own rising tennis star: VALERIA - be there as court history unfolds! MR11 6V 10W 6PCS. 6 x Halogen Light Bulb. Note: The bulbs are no front glass cover! Base type: G5.3. Easy Installation This lamp can replace regular 3.5 inches recessed light fixture and with a LED driver, no more accessories required. Installation can be finished in minutes. Special Design, The 3000K warm white creates a relaxed environment which you will feel like using it after work or before going to sleep. You can use it as a auxiliary lighting in the middle of the night when you don’t want the light disturb your chemicals which is responsible for sleep. The 30° beam angle is for a certain region in a room which is an added feature / advantage of auxiliary lighting. High Quality , The fin type radiator on the back of this down light enlarges the area of heat dissipation when using so it offers excellent heat dissipation effect, which makes the lamp safer. This advantage also. Type: JCD. Bright G8 Base JCD Halogen Light Bulb 120V 20W 20 WATT x 10. Lamp base: G8 bi-pin. Also note that monitor settings may vary from computer to computer and may distort actual colors. Good quality and durable.Small size and super bright.Low heat, energy saving, low power consumption, long service life.Best replacement for traditional light sources.Can be used as light decorations, torches, toys & gifts, car decorations, light box advertising, signal indicator, etc.Diameter: 5mmEmitted color: RedReverse voltage: 5VForward current: 20mAPeak current: 100mAPower consumption: 120mWWorking temperature: -40 to 80 degrees centigradeStorage temperature: -40 to 85 degrees centigradeWavelength: 660nmAngle: 45 degreeForward voltag: 2.0-2.2VBackward current: Max. 20mALuminous intensity: 15000mcdTotal weight: 15gPackage list: 50 x 5mm LED BulbNote:Light shooting and different displays may cause the color of the item in the picture a little different fr. Quantity: 50pcs Diameter: 3mm / 0.1" Emitted color: Blue Material: GaP Forward voltage: 2.8-3.6V Forward current: 20mA Backward voltage: 5V Luminous intensity: 1000-4000mcd Wavelength: 460-470nm Frequency characteristic: Low frequency Total weight: 6g / 0. Color temperature: Warm white 3000-3200K / Cool White 6000-6500K /. Beam angle: 120 degrees. Emitted color: Warm white/Cool White. LED emitter: 1W/3w. Shapes: round. Lens colors: water clear, color diffused. Luminous power: 250mw. Wavelength: 850nm. 50 Luminous diode. Emitted color: Infrared ray. With IR function, it is easy to use. Small and light appearance, it is convenient to carry. Note: Light shooting and different displays may cause the color of the item in the picture a little different from the real thing. Watts: 85W. 2 x 85W Lighting Bulb. Application:Photo Studio Light Bulb E27 scoket. Base Type:E27. Energy Saving Compact Fluorescent Spiral Bulb. Designed for Umbrella Reflector for High Performance. High luminous efficiency, pure rare earth trichromatic fluorescent tubes, green. You are purchasing 10W BioZone 1000, 1500, 2000, 2500, 3000, 4000, 5000 Compatible UV Bulb Lamp. The UV lamp life is governed by the life of the electrodes and is affected by the frequency of starting. MR11 12V 35W 6PCS. 6 x Halogen Light Bulb. Note: The bulbs are no front glass cover! Crisp, brilliant yellow light. 1 kit includes 1pce Fixed downlight fitting and 1pce Cermic Gu5.3 MR16 lampholder. Fixed type. Shape: Round. Product Type: JCD. 10 x Halogen Light Bulb (75W). Color: Warm yellow. 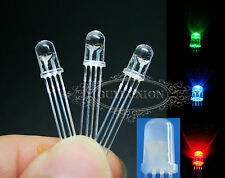 5x DXX Bulb Redhead Lamp Bulb 230v 800w 3200k. Wide light spread with 3200k Color Temp (under Lab test). Color Temperature: 3200k. Power: 800W. 5 x 800W Bulb. Features; high brightness. Spot uniformity. 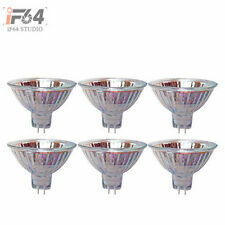 MR11 6V 15W Halogen Light Bulb 6PCS. 6 x 15W Light Bulb. Note: The bulbs are no front glass cover! Base type: G5.3. Light Color: RGB. Emitted Colour : Red / Green / Blue. Size: 5mm length :about 4.5CM. Lens Color : water Clear/diffused. Green 3 3.4 520 530 6000 8000 10 20-25. Luminous Intensity: 4000/8000/5000mcd. Blue 3 3.4 460 465 4000 5000 10 20-25. Style: Crystal, Modern / Comtemporary. However, if the product you are looking for doesn’t include an adapter, you can request an adaptor when purchasing your item. Lamp Type: 110V(E12), 220V(E14). A: Yes you can. Product Type: JCD. 10 x 40W Halogen Light Bulb. Color temperature (K): 2900. Color: Warm yellow. MR11 12V 20W 6PCS. 6 x Halogen Light Bulb. Note: The bulbs are no front glass cover! Crisp, brilliant yellow light. Shadow Very Large Modern Chandelier from MODANI L 33" x W 33" x H 55"
MODANI Shadow Very Large Modern Chandelier L 33" x W 33" x H 55"